Guess whose camera this probably is? That's right. My camera. Stolen out of the house as near as I can tell. Two days ago I had a camera, now there is no camera in our house. No one moved it. It's always in the same spot, but today, it ain't in that spot. On the 24th we had a pest control guy in because we have a mouse. Now I have no camera. Coincidence that he is here the same day someone breaks in, without leaving a trace of actually forcing their way in? Or he lifted the camera. No cables or charger? Need to sell ASAP? These details seemed to say 'stolen'. ...very clear with me, and I quote "it's just a camera, put it on the credit card, don't do anything with the crazies". She pointed out that in addition to them being the type of people that steal stuff for money, they would also know I'm showing up with around $800 if I'm going to buy it. She added that knives and guns are all possibilities. Hi - saw your ad on Craigslist. I need a backup camera so would be interested in this. I already have a 17-50 lens, so may just want the camera body if possible, but would still consider both otherwise. I passed the details on to J, who was also surprised as he'd had no reply from the seller. He later realised that he had automatically signed off his email with his initials, and if it was the pest control guy, he would know J's name from the work order, which would explain why he had not replied. The Craiglist ad had also now been pulled by the poster. Interestingly these two factors would later play to our advantage. The seller's reply to me would prove to be his undoing. Though it was from an untraceable yahoo email address, the name attached to the email address was 'D Vinnie". "Funny, the pest guy's name was Vincenza... not the same, but strangely close." And his first name started with D.
Coincidence? I didn't think so. We now appeared to have our smoking gun. 'Vinnie' is likely to be a common nickname for someone called Vincenza, so it seemed pretty likely that we were dealing with the pest control guy, though we had no hard evidence to prove they were one and the same person. Sorry I was away for the weekend just got back it is still for sale, will let it go for 700 if ur still interested? If ur free tonight we can meet up if you like? Because I will be busy for the next few days. And if ur interested, I would like to see as soon as possible trying to pay for my real estate course. This not only gave us some more evidence for the pest control company (was their employee doing a real estate course? ), but also showed us that the seller had no other buyers. Because J had accidentally signed his enquiry with his initials, which Vincenza would have recognised, he had been spooked into removing the ad from Craigslist very quickly, which now suggested I was his only potential buyer. I tried fishing for a mobile phone number or address, but with no luck, and at this point J decided to approach the pest control company. J phoned me later that evening. "Guess what I'm holding." He said. He had got his camera back. That morning J had met with a manager at the pest control company and presented all the evidence we had accumulated connecting 'D Vinnie' with their employee D. Vincenza. The manager was shocked. To his credit it took it really seriously, and told J that he would confront Vincenza with the evidence right away. That afternoon the manager turned up on J's doorstep, with his camera, and a full refund for the pest control work they had done. He explained that he had called in Vincenza for a meeting, told him about all the evidence, and said. "I am going out to lunch now. When I come back I want that camera to be on my desk." And it was. Vincenza lost his job, but at least he had made the right decision in returning the camera, and the police did not become involved. The guy had worked at the company for a year and had apparently been a great employee. As J said afterwards "I don't think the guy was a career criminal, I think he just made a really poor decision on the spur of the moment." I've been holding onto a second set of touring gear for friends to join in on the fun. There's a new set of twins coming this year....or next... so I have to clear out the closet. Asking $400 with the ski's waxed and ready for the weekend or $350 ready for pickup. Can drop off between Kitsilano and Mt Lehman/ Abbotsford. This sounded like a good deal, and it was local so I arranged to go see them (seemed a better idea as I would then know where the seller lived if there was any problem). When I arrived at the address in Kitsilano here in Vancouver I found it was an apartment block and I did not know the apartment number, so I had to call the seller, Justin, on his mobile. He came down and met me at the door with the skis. He laid them out in the hall and I had brought some boots I could try them out with. I explained I was pretty new to Alpine touring and asked if there was anything wrong with the skis. He told me no, they were fine - showed me some scratches and where they were worn down but this is to be expected with used skis. From my limited experience they seemed okay and he offered them to me for 300 dollars with the bindings and skins. He had another buyer coming in an hour he said. This of course is a standard sell tactic, which I ignored, but I thought the skis seemed decent enough so I bought them. Later that week I took them to a ski store to get them serviced. The counter guy took one look at them and said "Where did you get these?" That didn't sound good. "Ah, Craigslist. I am afraid we call them 'stolen or broken'." With his expert eye he had immediately spotted fine cracks on the sides of each ski. He told me the cracks would run into the core of the ski and it would have lost its integrity. With a sinking heart I asked him if it was still worth getting them serviced. He told me that professionally, he couldn't do it. "They will not ski properly. They are potentially dangerous." Later I called Justin on his mobile and recounted what the ski store had told me. In summary, Justin's response was: "Buyer beware... my friend." I told him he had sold me broken skis and I wanted my money back. His response? "Put them on Craigslist, like I did." Unfortunately (for me at least), I am not willing to 'pay it forward' in this way and am therefore stuck with a set of broken skis I have never used. When I told Justin I was going to write about it, he emailed to say that he would take the skis back... if I paid him 100 dollars. And then of course he could keep his profit and put the skis up for sale on Craigslist again. In his Craigslist ad, Justin offered to drop off the skis, that way there would be no way to know where he lived or worked. He only gave me a mobile phone number - much harder to trace than a landline. When I said I wanted to come and see the skis, he gave me a street address, but not the apartment number. When I discovered this on arrival and phoned him, Justin met me at the main door, so again I would not know his apartment number. He showed me the skis in a dimly lit hallway where they would be hard to study properly. Most significantly, I noticed that his email address, which was a Yahoo address and thus untraceable, had the attached name 'Justin'. Thus I did not know his last name, so could not trace him that way. Unfortunately (for Justin), on this last factor, he screwed up. On all our email correspondence his name was simply 'Justin', but when he emailed me to offer to take back the skis if I paid him 100 dollars, the name came up next to the email address as Justin Mattioli. Why had his email signature been 'Justin' all along, and now it was 'Justin Mattioli'? This is something you have to physically change in your email account. My theory? Justin Mattioli had reduced his name to 'Justin' to correspond with me so I would not know his full name, and once he thought the deal was done, and he was in the clear, he switched it back to Justin Mattioli. However, when he did send me one final email after I said I was going to write about it, he forgot to change his name and thus accidentally revealed his full identity. Now that seems pretty damning to me. So, I believe that Justin Mattioli (of Kitsilano, Vancouver, so there is no confusion) deliberately scammed me, and while there is very little I can do about it, at least I can warn others as he may try to do something similar in the future (and may have done so in the past). So remember, as Justin Mattioli likes to say, Buyer Beware.... my friend. A couple of days ago a Kenyan photographer contacted me about representation. He sent me a link to his blog which showed recent weddings and fashion shows he had covered. I thought the images were pretty good, but his most recent blog post, titled "Incredible Kenya... My Kenya" was quite different. 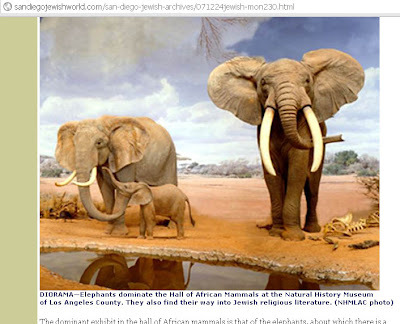 It portrayed the world famous wildlife of East Africa from cheetahs and lions to elephants and giraffes. There were some stunning, low light portraits, and some mediocre washed-out 'safari snaps'. This always seems suspicious to me. If a photographer has produced some excellent images, why pull them down with ho-hum everyday shots? The styles, composition and colours were also pretty varied and made me suspect that the images were not all by the same photographer. The blog post did not directly claim that the images were taken by him, so I thought it possible he was just displaying images he had found across the web to show off his country (of course, he should at the very least have credited the photographers, assuming that the images were Public Domain). I emailed the photographer asking him if all the wildlife images were his own. 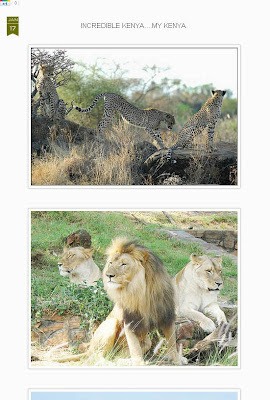 "Yes there are all my images, taken in Kenya and Tanzania." Well, to be honest, I didn't believe him, so I decided to investigate the images further. I used Google Search By Image to match some of the images, and very quickly found one on Wikipedia which was taken in South Africa and credited to another photographer. Not a good sign. Oddly, I kept being pulled back to one image, but I couldn't figure out why. It showed (above) a family of elephants by a dusty waterhole, the moment beautifully frozen with the largest elephant eyeing the camera. I studied it closer. Next to them was a carcass, picked clean, but oddly intact. There was no sign of the usual debris you get around African waterholes (dung, rocks, tracks) and the wonderful lighting of the elephants didn't really fit with the washed out midday sky. Then I thought "I've got it! They really are frozen!" I used Google Search By Image to try to find the original source of the image, but as most of the results were from 'free photo wallpaper' sites, I just couldn't find anything useful. 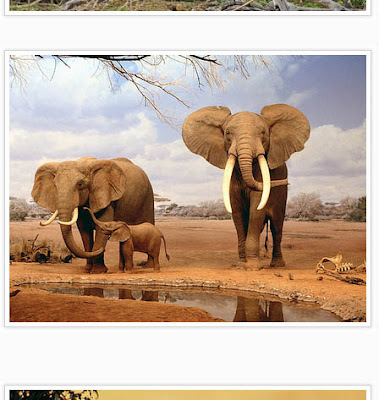 The first row of images seemed to be all the same (some reversed) but on the second row (circled in red) in the first image, even though the poses of the elephants were unchanged, the top foreground twigs were different. Bingo! So it appears the elephants actually 'live' in the Natural History Museum of Los Angeles County. Because the elephants were 'frozen' in their poses, the 'visually similar' option on Google Search By Image found them easily, even though the images were taken at slightly different angles. And that made me laugh. 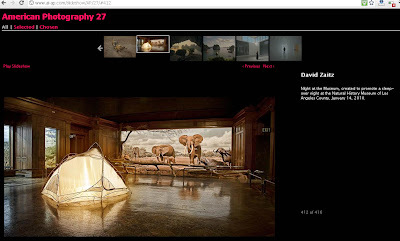 Here we had a photographer who stole all these images and claimed he had taken them on safari, without realising that one of them was actually a museum exhibit. Needless to say, we will not be representing this photographer, but we have quite a few other photographers in Kenya who we can recommend. "Chris, I followed your link and got a chuckle out of it. Then I went to review the AI-AP show from last year and found this. Made me laugh out loud." The image is a beautiful shot of the African Mammal Hall at the Natural History Museum of Los Angeles County by photographer David Zaitz, showing an internally lit tent, and... what's that in the background? 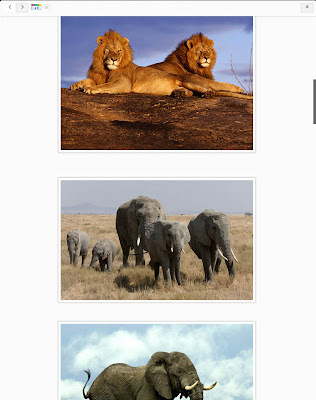 Oh yes, it's our family of elephants, supposedly photographed in Kenya/Tanzania!